In this section, you will review the different indicators for identifying problems in your code. Build problems are displayed in the Problems view and annotated in the vertical ruler of your source code. 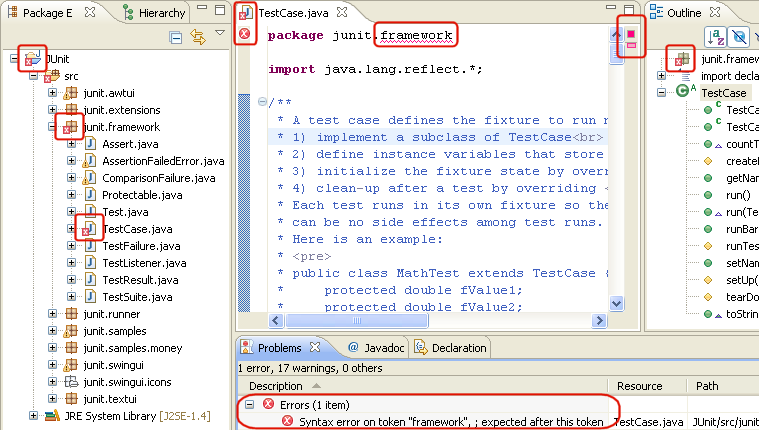 Open junit.framework/TestCase.java in the editor from the Package Explorer view. Add a syntax error by deleting the semicolon at the end of the package declaration in the source code. The editor tab is annotated with a problem marker. You can hover over the marked word in the editor to view a description of the problem. You can also hover over the problem markers in the vertical or overview rulers. Click the Close ("X") button on the editor's tab to close the editor. In the Problems view, select a problem in the list. Open its context menu and select Go To. The file is opened in the editor at the location of the problem. Correct the problem in the editor by adding the semicolon. Click the Save button. The project is rebuilt and the problem indicators disappear. In the Outline view, select the method getName(). The editor will scroll to this method. On the first line of the method change the returned variable fName to fTestName. While you type, a problem highlight underline appears on fTestName, to indicate a problem. Hovering over the highlighted problem will display a description of the problem and applicable quick fixes. On the marker bar a light bulb marker appears. The light bulb signals that correction proposals are available for this problem. Click to place the cursor onto the highlighted error, and choose Quick Fix from the Edit menu bar. You can also press Ctrl+1 or left click the light bulb. A selection dialog appears with possible corrections. Select 'Change to fName' to fix the problem. The problem highlight line will disappear as the correction is applied. You can configure how problems are indicated on the General > Editors > Text Editors > Annotations preference page.